Was there ever a machine more adaptable, scalable, or shape-shifting than the excavator? Here we look at the versatility behind a selection of Volvo Construction Equipment’s mighty machines. Designed to be highly productive, efficient, durable and cost-effective, the Volvo mini excavators are multi-purpose tools that deliver great performance. 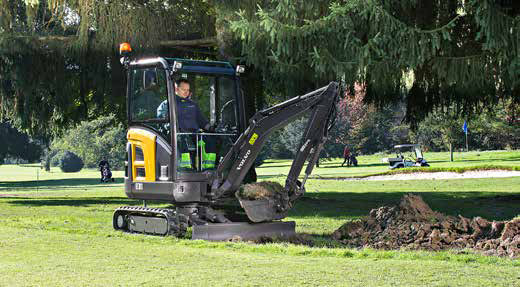 Small yet powerful, these compact excavators are built to deliver superior performance that lasts. Equipped with a tough rear counterweight and casted digging equipment to ensure maximum durability for a long machine life, Volvo compact excavators are designed to work for longer with fully protected hydraulics and a strong, reinforced dozer blade. The One With The Small Bum With powerful, fuel-efficient Volvo engines, a perfectly matched hydraulic system and a robust body, the Volvo short-swing radius excavators offer remarkable productivity, stability, ease-of-use, and safety when working in confined or restricted conditions. Available in both compact (1.8 to 8 tonne) and general purpose (14 to 30 tonne) getting around the site on these versatile machines has never been easier thanks to automatic two-speed travel for optimised traction, as well as hydraulic travel pedals for easy and accurate track control. 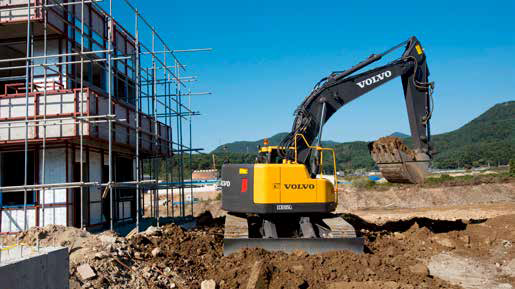 To provide the most versatile machine possible on demolition job sites, the Volvo EC480EHR reaches a lofty 28m. Purpose-built to suit the needs of heavy-duty demolition with both high reach/medium reach and digging capabilities rolled into one, the highlight of the EC480EHR is the patented modular boom system, which includes an innovative hydraulic modular joint with hydraulic lock mechanism to release digging equipment and change from the high reach demolition boom to a medium reach configuration in a simple and swift operation. With a knockout bucket breakout force of 478kN (ISO 6015) and an arm tear out the force of 420kN (ISO 6015), the 90-tonne class EC950E is the Muhammad Ali of excavators, offering superior digging force, particularly when working with hard and heavy materials. Constant high hydraulic pressure delivers power to the machine when needed. Built with protected components, including a heavy-duty boom and arm, and a strong frame structure, the EC950E is no pushover and can be relied on for longevity and sustained uptime in demanding applications. Founded in 1974, CJD Equipment is a privately-owned Australian company and leading provider of world-class equipment and trucks. Partnering with international manufacturers, CJD Equipment offers a diverse range of superior products from iconic brands such as Volvo Construction Equipment, SDLG Construction Equipment and Kenworth and DAF trucks. It has been over a quarter of a century since construction giant Volvo CE partnered with CJD Equipment. 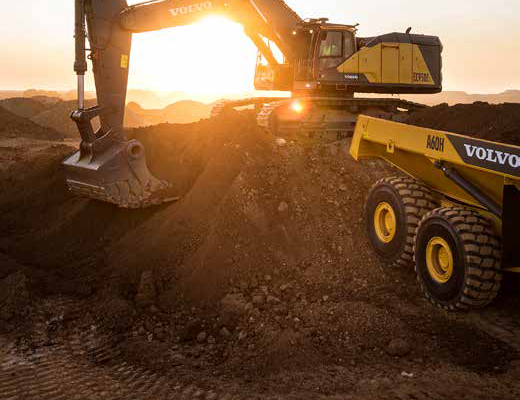 This successful partnership has supplied the construction and earthmoving industries of Australia with Volvo’s world-class products, along with after-market service and support right across the country. CJD’s branch and dealer network spans the country from Australian capital cities to regional country towns, providing 24/7 sales, parts and service support from over 500 highly experienced staff with knowledge and skills that is unsurpassed in the industry. Big Enough to Trust, Small Enough to Care – CJD strongly believe the only way to do great work is to love what you do and are passionate about supporting customers for the long haul. Find your ideal Volvo excavator at The National Diesel, Dirt and Turf Expo from Friday May 3 to Sunday May 5. Visit CJD Equipment at site number 43 for more information on how these versatile machines can work for you.